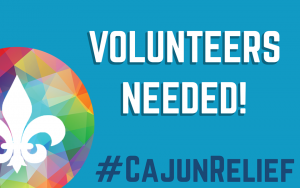 Yesterday, more than 400 citizens were inspired to sign up to volunteer with Cajun Navy Foundation. CNF dispatchers worked persistently through the night prioritizing and reevaluating emergent needs. Now at critical stages of rescue and wellness checks, all boots will be on the ground this morning. With some victims of Hurricane Michael trapped and wounded, time is of the essence. Hundreds of volunteers will be split between Georgia and Florida in the hardest hit areas. Teams are now en route and will continue trickling in through the weekend. Some people in other states who are not yet able to get there are organizing supply drives and even convoys to transfer and distribute the provisions. However, the needs are critical and call for still more volunteers. CNF Dispatcher Jamie Bitner finally had a minute late last night to calm her mind and regroup from the demanding but promising day. Jamie said that while the need is still great and will be for a while, CNF has seen so much love in just one day. She was in awe of the scores of people who just got in their vehicles and met at rally points to dig people out of their homes. As she was winding down from her day, Jamie admitted that she had shed some tears – not tears of sadness, but because she was so proud of the outpouring of love from the Cajun Navy Foundation volunteers. “We had people in towns we couldn’t get into, stepping up to help one another. We just need manpower and compassion. We need neighbors helping neighbors. It’s been horrible, but today I saw hope,” said Jamie. From the slightest need to the most immense, CNF needs all hands on deck – everything from welfare checks to contractors. To volunteer, please visit www.CrowdRelief.net and fill out a volunteer form.